"how much to retire at age 65"
How Much to Retire at Age 65? This question of how much to retire is difficult to answer as people retire at different times with different personal and financial circumstances. You also don’t know how long you will live in retirement. The page looks at information and research papers regarding funding an income in retirement and is factual in nature which means it does not consider your personal circumstances (ie you may require different retirement age, income and capital amounts to reach your retirement goals). If you require personal advice you must speak with a qualified financial planner and should not use this page as the basis of making retirement decisions. You can use the menu bar at the top of website to click on state and then city to find a qualified financial planner close to you. Each year The Association of Superannuation Funds of Australia (AFSA) publishes retirement standards calculating what would be considered a modest and comfortable lifestyle income in retirement. For those aged 65 the results are below for Mach 2017 quarter for single and couple. ​The figures assume that the retiree(s) own their own home and relate to expenditure by the household. This can be greater than household income after income tax where there is a drawdown on capital over the period of retirement. Single calculations are based on female figures. 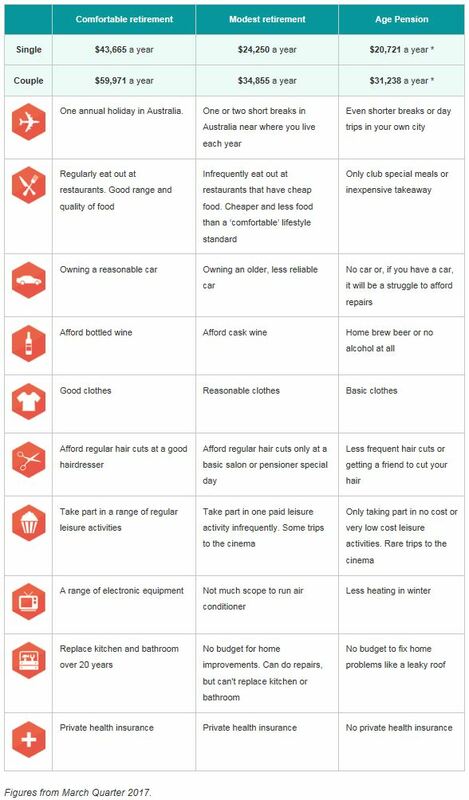 The chart below from super Guru breaks this down into actual day to day impacts of income levels and lifestyle in retirement. As you can see there are large lifestyle impacts across a comfortable, modest or age pension only retirement. To achieve the incomes above The Association of Superannuation Funds of Australia (AFSA) has calculated the required superannuation balances for those retired around age 65. The tables and calculations below also factor in Centrelink Age Pension. It also assumes all capital (aside from family home and personal assets) is drawn down by the end of retirement/life expectancy (ie not much superannuation left for kids). 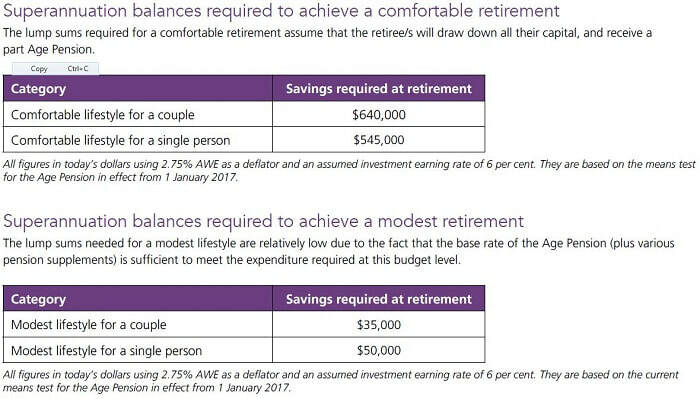 As show above a couple targeting a comfortable income in retirement would require superannuation of at least $640,000 or $545,000 for a single person. The information above is only a guide and does not take into account your personal circumstances. If you are unsure about your retirement planning, you should speak to a qualified financial planner who will consider your personal circumstances. You can search for financial planners using the website menu at top of the page.